From the cover of Richard Sha's forthcoming book, Imagination and Science in Romanticism. 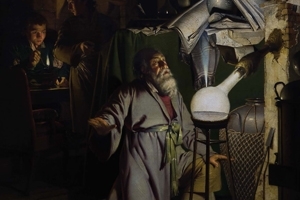 The painting is Joseph Wright of Derby's "The Alchemist Discovering Phosphorus." “Let your compassion be moved, and do not disdain me. Listen to my tale: when you have heard that, abandon or commiserate me, as you shall judge that I deserve.” That was the monster talking to his creator, Victor Frankenstein. The tale of Mary Shelley’s Frankenstein is a rich tapestry of ideas, almost impossible to judge without deep reflection. Published to mixed reviews in 1818, the book became a literary classic that still resonates today. In Frankenstein’s bicentennial year, American University Professor Richard C. Sha will publish his own book, Imagination and Science in Romanticism, which grapples with Mary Shelley’s book, her husband Percy’s Prometheus Unbound, and many other relevant texts. In the College of Arts and Sciences, Sha is a literature professor, affiliate professor of philosophy, and a member of the Center for Behavioral Neuroscience. While writing his new book—to be released in August—he drew on that interdisciplinary background. In an interview, he discusses his own research and the indelible legacy of Frankenstein. “There’s probably no other work of fiction that has had more influence on the way that we think about science and technology,” he says. Even for a book that’s 200 years old, Sha almost certainly breaks new ground in his Frankenstein research. “It’s daunting to think of how much has been written on Frankenstein. If you actually thought about that, you would not choose to write about it. That said, there are all of these unexplored avenues, and that’s something that I try to impress upon my students. You ask an important question, and then figure out how you’re going to get an answer to that question,” he says. In Imagination and Science in Romanticism, he looks at Mary Shelley’s interest in obstetrics and embryology. Shelley lost three of her four children, and her mother, noted feminist Mary Wollstonecraft, died soon after giving birth to her. Sha says these existential questions of life and death influenced Frankenstein. Sha is possibly the first scholar to apply the Clarke Brothers’ work to the novel. He also discovered the writings of Dr. George Furnivall, who discussed treating Mary Shelley in his patient records that had been sitting in the Cambridge University Library. In his broader look at midwifery, Sha notes that men frequently replaced women as midwives because they were deemed “scientifically trained.” In actuality, men used instruments to crush the skull of the new baby, if the mother’s life needed saving. “When Victor Frankenstein basically says, ‘I collected the instruments of life so that I could infuse being into the monster,’ instruments of life would have been understood during the time as instruments of death. Male midwives’ instruments were only brought out when the labor was complicated,” Sha says. “It’s not for or against science. It’s looking at how you know bad science from good science,” he says. The Romantics were also wary of the speed and unconscious nature of the imagination. Sha notes that Romantics wanted the imagination and reason to cooperate with one another. “When people think about the imagination, they think of its powers of creativity. And it’s not that the Romantics didn’t admire the imagination’s ability to be an engine of discovery. But they also recognized that if you cannot distinguish between what is imagined and what is real—if you can’t make these kinds of distinctions—then you have no basis for knowledge,” he explains. In the novel, Victor Frankenstein repeatedly fails to recognize that there’s a potential difference between signs of life and life, Sha says. Even the monster is more precise, saying he attempted to restore animation while rescuing the girl from the river. On October 24, the Literature Department will hold a special colloquium on Frankenstein. Sha is currently teaching a course on Science and Romanticism, and they recently discussed the novel. He attempts to convey to students Mary Shelley’s erudition and curiosity. For instance, Shelley once wrote about the death of her child, and in the next sentence mentioned reading Edward Gibbon’s The History of the Decline and Fall of the Roman Empire. And given Frankenstein’s depth and profundity, it’s remarkable that Shelley started drafting the novel at age 17.